The in-laws are coming from Texas to Oregon to our tiny apartment for Thanksgiving. We had two kitchen table chairs, with dirty white seat covers. There will be 7 of us for dinner. See the problem. 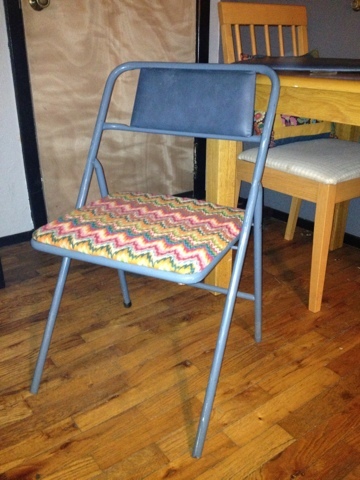 We went hunting and found these cheap folding chairs at vintage/ second hand store in Springfield. We have found a few other goodies there that we love as well. These were rather hideous, but at $5 a piece I couldn't say no. After three trips to the hardware store,cussing and whining; due to a broken staple gun, the task was completed. 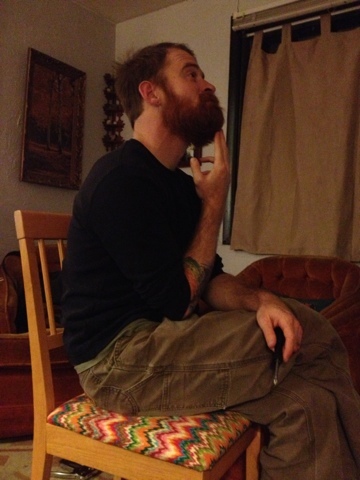 We recovered 5 chairs for Thanksgiving. Our guest should be proud our work, especially Hubby's handy work. These tasks are usually my domain. He wanted to help. :-) He is a great cleaner and helps in the kitchen. I never imagined he would like this task. 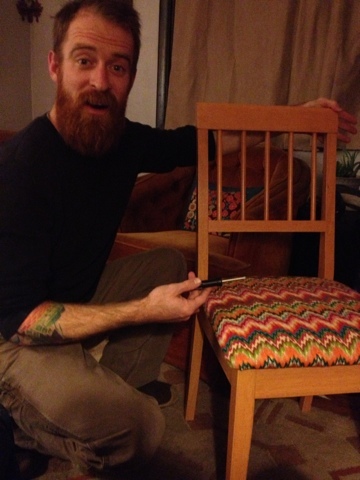 After completing "his" chair, he asked what else he could reupholster. Too cute, he and the awesome new chairs. 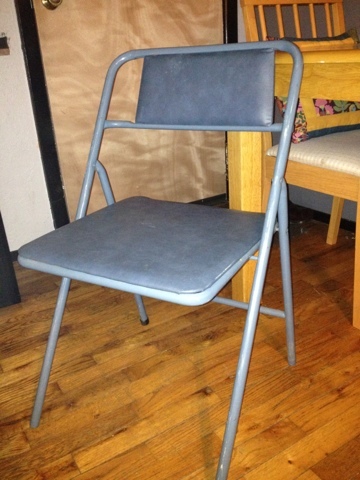 The folding chairs were rather ugly all baby blue. I think it makes them look modern and cohesive by having them all covered in the same fabric. The fabric is a Jo-ann's flannel that I got 75% price at a store closure, that I hoarded. Iam so proud, so is he, and now everyone can sit and eat, which is important.